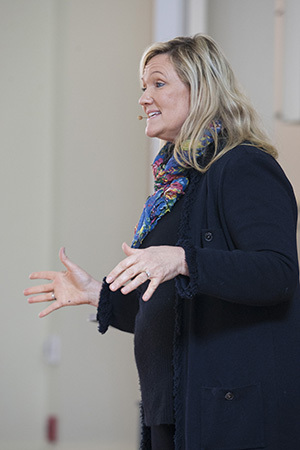 Popular Christian fiction author Karen Kingsbury delighted two Samford University audiences Thursday, Jan. 31, with advice on how to write their own best-selling life stories. Love well, laugh often, and most importantly, find life in Jesus Christ, Kingsbury told Samford students at an on-campus convocation and Legacy League members at a scholarship luncheon. While she loves hearing how God is using the genre of Christian fiction to change lives, "The more important story is the one I'm writing with my own life," said Kingsbury. The best-selling author of more than 50 novels waived her speaker's fee so a scholarship could be presented to a Samford student during the convocation in Reid Chapel. Lizz Milne, a senior English major from Mobile, Ala, was chosen from 30 nominees to receive the one-time $5,000 scholarship. Nominees were judged on financial need, academic achievement, outstanding character and involvement on campus and in the community. Kingsbury noted that while everyone has people in their lives who present challenges, it is important to love them all. "Don't give up on the tough people that are hard to love," said Kingsbury, relating the story of her brother, Dave, who struggled with his faith for decades before finding Christ shortly before his death. Laughter is a good thing. "It is important to not take ourselves too seriously," said Kingsbury, adding that she and her husband often found humor while raising their six children, three of them sons they adopted from Haiti. "We laughed our way through the first year," she said, recalling experiences with the family's young Creole-speaking additions. Even when her husband, Don, had a stroke and other medical problems in 2010, they always found ways to find laughter, she said. But, the most important thing is to find life in Christ, she believes. "If Jesus Christ is the hero of your story, there's a guaranteed happy ending," said Kingsbury, whose novel, Loving, was ranked No. 1 on The New York Times bestsellers list the first week it was released in 2012. Her novel, Coming Home, also released in 2012, ranked No. 5. "You college kids are up against it," she told her student audience, calling them the rope in a moral tug of war. "But God has great plans for you and those in your life. You are the culture changers that can hold the light of truth for your generation. He is using you to write a beautiful story." She told the luncheon audience that the greatest thing God has for them is still ahead. "If you're still breathing, God has a plan for you," she said, calling Legacy League members heroes for their support of Christian education through the scholarships they provide for Samford students. "These university students are the hope of our future. We need to support their dreams," said Kingsbury, who had met many at a meet and greet before the convocation lecture. "It was a pleasure to see these Samford students who are living the truth when so many adults are abandoning the truth." She closed her address at Vestavia Country Club by reading her latest children's book, Let Me Hold You Longer, a tender reflection on the child-parent relationship. Luncheon program speakers included Keith Loomis, father of Samford student and Legacy League scholarship recipient Kaleb Loomis of Montgomery, Ala. The elder Loomis, who was diagnosed with a brain tumor in 2009, told how his medical needs made it impossible to finance Kaleb's "heart's desire" to attend Samford and prepare for his life's calling. "You and many others like you are the hands of the Lord Jesus," said Loomis, thanking the group for their generosity in supporting scholarships. Legacy League executive director Dr. Jeanna Westmoreland announced a new scholarship to join more than 20 named scholarships that are funded through events such as a 5K run and holiday tour of homes. The Walker Ministry Scholarship was established in 2012 in memory of Dr. Gerald and Mrs. Martha Lou Fagan Walker, and in honor of more than 20 family members who have attended Samford, including their daughter and Legacy League member Cynthia Walker Watts. Following the luncheon, many of the more than 278 attendees lined up for Kingsbury to sign her most recent book, The Bridge. The convocation audience included eight Kingsbury fans from Union Hill Baptist Church in Oneonta, Ala. The members of a ladies Bible study group all had copies of The Bridge in hand. "We are going to give a signed copy to the church library," said leader Linda Fleming as the group posed for a photo with Kingsbury. At both events, Legacy League president Penny Kimrey commended Kingsbury for her commitment to Christian education and her desire to serve others. "We look forward to see how God continues using the seed that was planted today," said Kimrey.